A press release issued by the FIM, one of the sanctioning bodies behind the Monster Energy AMA Supercross series, has announced that Yoshimura Suzuki motocross/supercross rider James Stewart has tested positive for a banned amphetamine substance following his podium finish at the Seattle supercross on April 12. A urine sample of Stewart’s was tested by a WADA (World Anti-Doping Agency) facility which works in conjunction with the FIM to enforce doping rules for athletes. The FIM has provisionally suspended Stewart from further competition effective June 20. Nevertheless, Yoshimura Suzuki states Stewart will be on the line for the next race of the Outdoor motocross championship in Tennessee on June 28th. We understand that, unlike the Supercross series, the Outdoor Motocross series does not feature the FIM as a sanctioning body, and this may allow Stewart to compete even if the provisional suspension remains unresolved. The Fédération Internationale de Motocyclisme (FIM) has advised US Supercross rider James Stewart that he is provisionally suspended pursuant to Article 7.6 of the FIM Anti-doping Code. The decision to provisionally suspend Mr Stewart was taken following the receipt of a report from the WADA accredited laboratory in Cologne indicating an Adverse Analytical Finding of Amphetamine in a urine sample collected from him at an in-competition test carried out by the FIM at the round of the Monster Energy AMA Supercross, an FIM World Championship held at the Century Link Field, Seattle, Washington, on 12 April 2014. Mr Stewart has the right to request and attend the analysis of his B sample. A Provisional Suspension imposed by the FIM does not in any way prejudge the question as to whether an anti-doping rule violation under Article 2 of the FIM Anti-Doping Code has actually been committed. This question will be addressed by the FIM International Disciplinary Court (CDI) when it adjudicates on the merits of the case. Mr James Stewart is provisionally suspended with effect from 20 June until further notice. 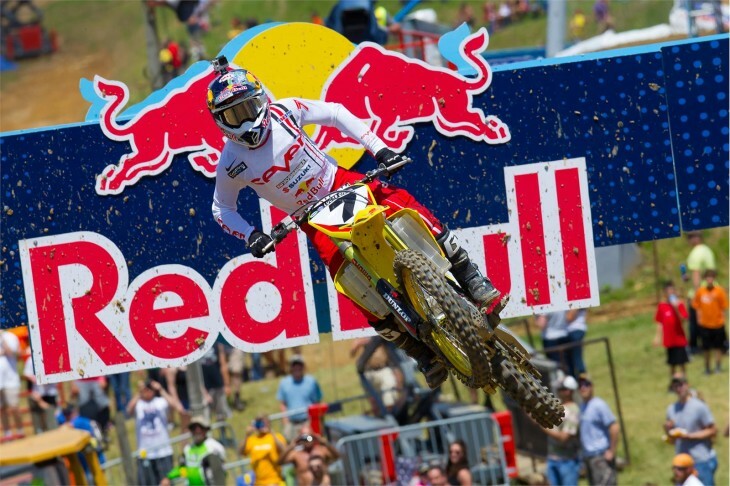 CHINO, CA (June 19, 2014) – Yoshimura Suzuki Factory Racing’s James Stewart has reported that he received notification from the FIM on June 17th, 2014 that a WADA test administered to him on April 12th, 2014, after the Seattle AMA/FIM Supercross, showed a positive result for a substance on the WADA 2014 Prohibited List. The medication in question is and has been prescribed to Stewart by his physician to treat a long-term condition. Stewart, with the full support of Yoshimura Suzuki Racing, is willingly communicating with WADA and taking all appropriate steps to resolve this matter and plans to be at the starting gate at the Tennessee National in Blountville, TN on June 28th, 2014. I BELIEVE A FAILED TEST IS A FAILED TEST. JAMES SEEMS TO BE GETTING AWAY WITH EVERYTHING. TAKE HIS ARREST FOR IMPERSONATING A POLICE OFFICER. AMA DID NOTHING. JLAW GOT THROWN OUT FOR LESS. NEXT STEWART RUNS EVERYONE OFF THE TRACK LAST YEAR NO CONSEQUENCE. NOW HE IS HE GOT CAUGHT DOPING WITHOUT A LEGAL DR PRESCRIPTION THAT YOU HAVE TO OBTAIN 30 DAYS PRIOR TO THE OFFENCE. AND IS GETTING AWAY WITH IT. LET ME POINT OUT LANCE ARMSTRONG WHAT HAPPENED TO HIM TOOK AWAY HIS 7 TOUR DE FRANCES. STRIP STEWART AND MAKE AN EXAMPLE OF HIM. TAKE AWAY HIS CHAMPIONSHIPS AND ALL HIS “ALL TIME WINS.” IF THEY DO NOTHING THEN THIS WILL CONTINUE TO HAPPEN IN THE FUTURE. Am I the only one who sees the hypocrisy of having Red Bull sponsor a series where stimulants are banned? What if Stewart has been doping his whole career? We’ll never know. Fastest man on the Planet – yeah right. This is a bit hard to understand. If his doctor prescribed him a banned drug for a long term medical problem he should have gotten a medical waiver in advance of this coming up, or his team should have. There’s more to it. well that’s it then. once i got to this part, i promptly stopped reading. We do not know the nature of the code of conduct he signed with FIM. If they see him as being in violation of their code for racing outside of their jurisdiction, they might drop the hammer on him for SX, where he fills many a stadium seat for Feld Entertainment and all associated sponsors. Could be a mess..
As someone who also makes a check in an industry where drug testing is expected, (Commercial flying), the best way to never test positive still remains the obvious tactic……don’t take ANYTHING! The suspension was from the F.I.M. The U.S. motocross series is not F.I.M sanctioned. As the parent of a child who was diagnosed with ADHD I can tell you drugs are over prescribed to children. Mostly from pressure from teachers and schools. Sometimes parents think normal children are hyper active. Guess what? Some are but don’t need medication. Some drugs on the banned list give healing a boost. But they can also be abused to make the body “better”. There is a stigma attached to children with ADHD and some the drugs are life saving. I can understand keeping silent about a condition. Of course I realize it could be a sham but the governing bodies should be able to recognize legitimate use and act accordingly. You know you hear this about top athletes all the time. ” my doctor prescribed it for a long term condition”. You’d think if a pro athlete had to go to a doctor for an issue, he would take the list of banned substances with him, and say ” you can’t prescribe any of these drugs to me”. except the list of banned substances is ridiculously long, constantly changing and never complete. And you know this how? Supposition? Oh I believe its long, I just dont believe there isnt a list an athlete with a medical condition can give a doctor of either banned or approved drugs so that he can get medical attention wothout running afoul of the governing committee and being suspended or banned. The option of a “Therapudic Use Exemption” exists. It’s common in cycling where a large percentage of pros have exercise induced asthma, it seems. If James is being treated for an ongoing condition, his management should have gotten him a TUE, or his doctor should’ve prescribed something else. Athletes can and will get a dispensation from WADA/USADA for prescription drugs _IF_ they follow the rules and ask for it beforehand… Afterwards? There is always an excuse. If he rides during the suspension do any points he earns during that period actually count?